The Countries embraced within the Travels of St. Paul. Lower Egypt with the Peninsula of Mt. Sinai and the Journeys of the Israelites. 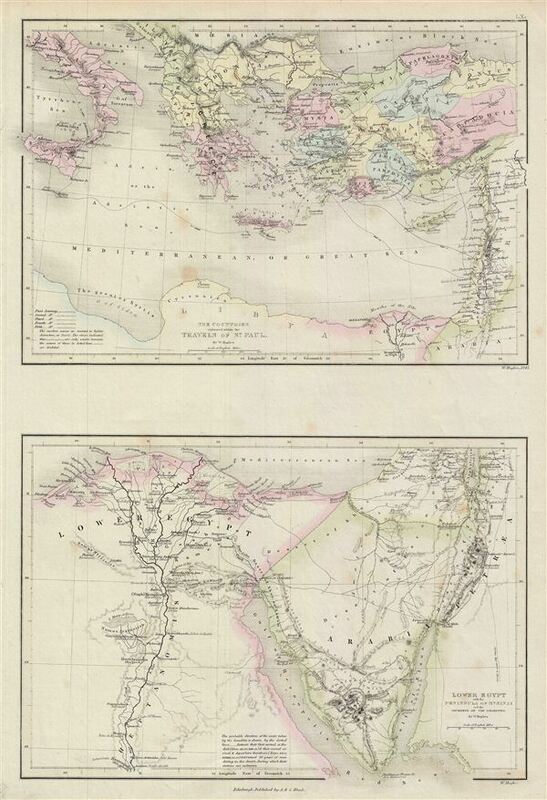 A fine example of Adam and Charles Black's 1851 map of Greece, Italy, Asia Minor and Lower egypt in antiquity. The map is divided into two parts: The upper map covers the countries traveled by St. Paul, which include Italy, Greece and the Balkans and Asia Minor south as far as Arabia and egypt. The lower map covers Arabia and egypt and follows the journeys of the Israelites, including egypt, centered on the Nile River, and extending south as far as Hermopolis. Both maps features ancient and contemporary place names, ie. Candia and Crete, for each destination - an invaluable resource or scholars of antiquity. The journeys of St. Paul are depicted on the upper map by dotted lines and differentiate from the first to the fifth journey. The lower map also depicts the Journeys of the Israelites from their first arrival at Kadesh and their second and third arrival and departure thereof. Throughout, the map identifies various cities, towns, rivers, mountain passes and an assortment of additional topographical details. The upper map is hand colored in pink, green, blue and yellow pastels to define provincial boundaries. The lower map is outlined in red and green color depicting boundaries. The map is engraved by W. Hughes and issued as plate no. LX in the 1851 edition of Black's General Atlas. Rumsey 2305.072 (1854 edition). Philips (atlases) 4334.